This is one of the 3 cards I made to swap. 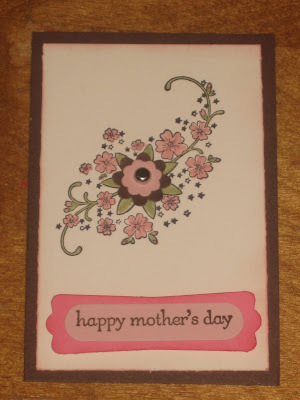 I loved making all these beautiful cards. I just love the color combinations. This card uses Chocolate Chip, Regal Rose, and Blushing Bride card stock. I used the stamp set Messages for Mom and colored it using SU! Markers. I added a flower using the Boho Blossom Punch and a brad. I started out by making an ATC and then I added it to a full sized card front. I also used the Medallion stamp. I embossed it on the Level 1 DSP pack that had been cut out with the Top Note Die and sponged it with Regal Rose ink. I added some Chocolate Chip ribbon to finish it off. NOTE: The ribbon is a retired item. You can get this same look by coloring White ribbon with re-inker, markers, or the ink pads.